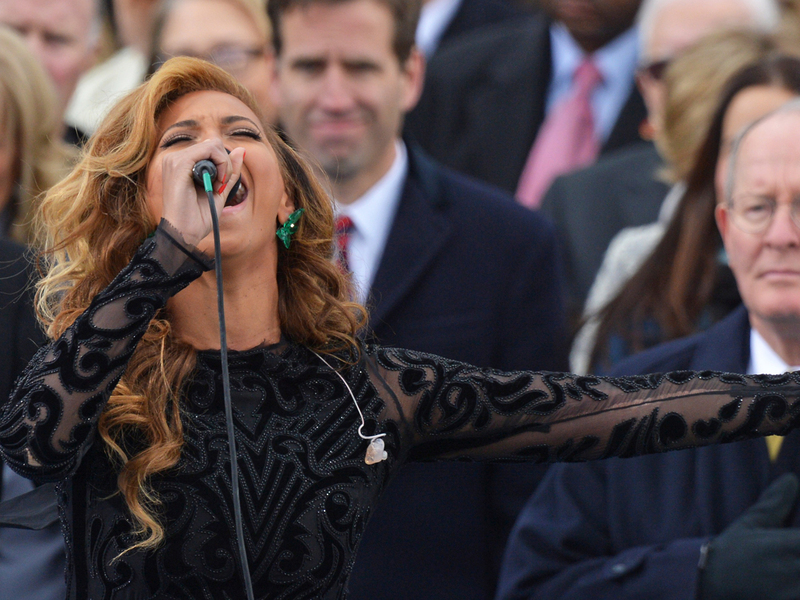 After President Barack Obama was sworn in for his second term as president of the United States, Beyonce closed the inauguration ceremony with a performance of the national anthem. Wearing a floor-length Pucci dress, Dior coat and emerald earrings by Lorraine Schwartz, the superstar sang "The Star-Spangled Banner" before the crowd assembled outside of the U.S. Capitol in Washington on Monday. She was accompanied during the performance by the United States Marine Band. She arrived with husband Jay-Z, who was dressed in head-to-toe Tom Ford, according to USA Today. James Taylor and Kelly Clarkson also performed during Mr. Obama's second inauguration. Taylor sang "America the Beautiful," accompanying himself on his guitar. Clarkson performed "My Country 'Tis of Thee," accompanied by the United States Marine Band. Tell us: What did you think of the inauguration performances?